Heyho! I am back from a 1 month 3D printing project, working at UMC Rostock by invitation from an extremely cool and open minded Prof. C. Nienaber, Head of the Cardiology Dept. This is going to be a 2 or even 3 piece news article, as there are many things to say, many things to show and in order to optimize your reading experience it would be uncool to put it all into one piece. So be on the lookout for the “Part 2” and “Part 3”. We had a 9 day delay due to the package not being delivered yet, so I was left with only 21 days to test, print, fix, print, test, learn, print, print you get the idea. Luckily the package, when it arrived didn’t have any damage to it. This is a major issue with 3D printer deliveries (of course most blame by far lies with the delivery companies, some of course with the manufacturers and their packaging techniques). I have read a bunch of stories on parts being broken, LCD screens being pushed in with a cracked surface, (x, y, z) belts being out of alignment etc. And of course, you most likely get a new replacement or a refund or what not, but these things last a while (another week or two can go by) and in our case time was a luxury and we could not afford to wait another week. Keeping my fingers crossed to get the 3D printer in one piece, this time apparently did the trick. So after setting up my workstation, we dug into the packaging of Ultimaker2. The unboxing process was fun, was like Christmas in mid July. 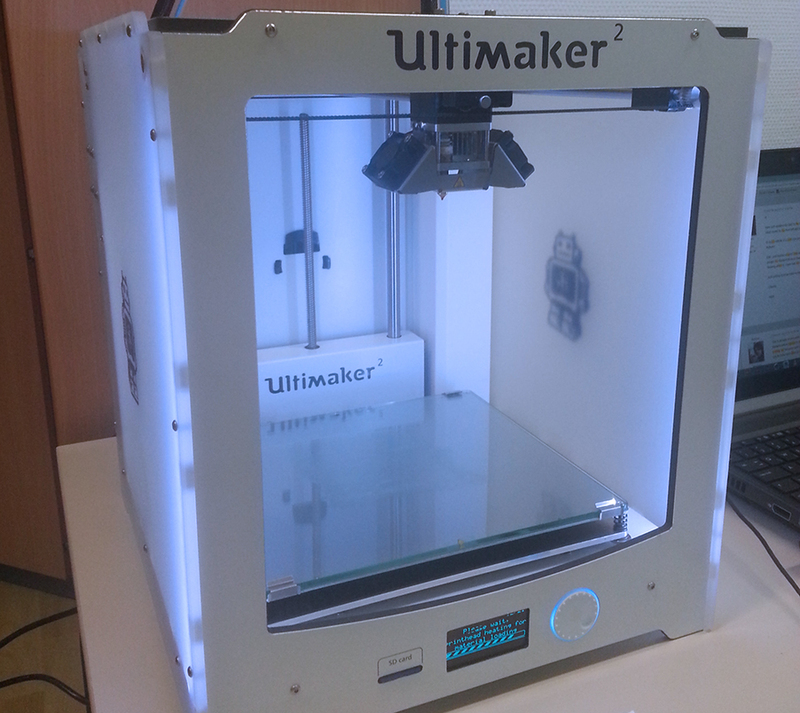 Prof. C. Nienaber made the first cut and unveiled the beauty that is The Ultimaker 2. The slick Dutch design is really something to just sit back and absorb for a minute or two. Its white, sterile, clean, minimalistic design is just up my alley. With a snip here and a snip there, everything was ready for the process of starting the first print. Once you plug the “The Beauty & The Beast” into the power outlet, the bright white LED lights come on inside the frame. The light gives it that nice soft look through (what I believe) the side plexy glass walls. As a result the Ultimaker logotype pops out nicely on both side walls. The LED screen and the rotational button both in cold shades of blue and green add that extra touch to the over all amazing design of the Ultimaker 2. The sounds, well that’s another story, somehow when the fans start to do their dance and the (especially Z axis) starts to do its magic it’s like you’ve been pulled into a space ship or in the middle of a Sci-Fi movie. 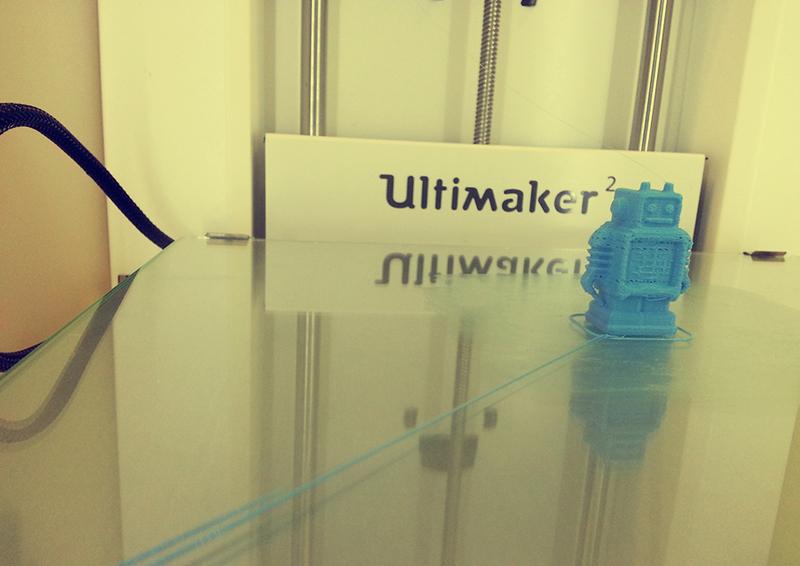 All in all the visual and audio experience of the Ultimaker 2 is amazing from the very beginning. Our heavy order of ColorFabb 3D filaments came with a delay of one week, (luckily prior to the printer arriving, we received 5 spools of “Traffic Red” from an unknown source – yeeey us!) and it was the “Christmas mid July” story all over. We received 36 spools (0.75kg per spool) of different colors and types of materials (solid, transparent, translucent, even “Glow in the Dark”). As you can see on the photo above (and no I could not have made it any lower since then it would lose its point) you could literally call it the “Wall of Colors”. I was both excited and frustrated at the same time – So many materials, so little time. At that point I was left with only a few more days before I had to go back home, since our project was coming to an end. Nevertheless I pulled a few all-nighters to make the newly arrived materials count and with the 5 “Traffic Red” spools we received even before the printer, I made a lot of trial and error test runs with a few great prints, learned a great deal and most importantly proved on a daily basis that what I came there to do was not only possible but even exceeded the expectations of the Dept. As a “Hello World” print, of course I printed the Ultimaker 2 robot – you wouldn’t want to Jinx your 3D printer now would you ;) As an out of the box print, well it did have some issues. It started off amazingly, the legs from the first layer to the top of the legs it was amazing, great layer resolution no issues at all. Then when the print-head came up to the torso part of the robot there was some under-extrusion going on and some holes in the layers started to appear further down the line. Which thanks to a great Ultimaker “Maker” community was quickly fixed and the next 3D print I made was almost perfect. I made the “Pikachu” downloaded the model from Thingiverse. Came out perfect, again with some minor issues on the overhangs. But considering this was my 2nd print – it was awesome.